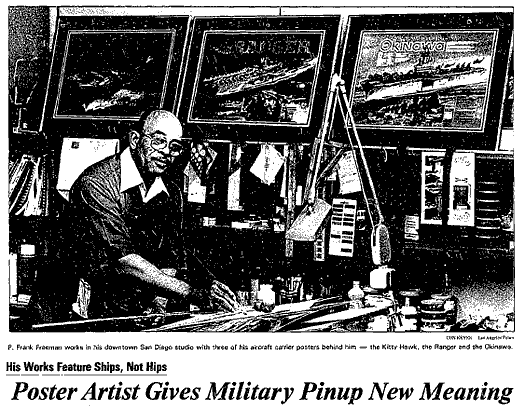 On June 18, 1982, the Los Angeles Times (San Diego County section) featured a story titled “Poster Artist Gives Military Pinup New Meaning.” The article provided insight into how a failed enterprise concerning a local bank, the area’s NFL team (the San Diego Chargers) and a local artist, launched an idea that became a series of “photographic” poster renditions of the Navy’s most versatile weapons, its aircraft carriers. Copies of these photographics carrier posters were in high demand, even finding its way to the President Reagan White House where a copy of this artist’s USS Constellation was displayed. These lithographs, known by the series’ name, A Powerful Force for Freedom, were developed during the 1980s, by Mr. P. Frank Freeman, a well-respected international commercial artist. During the design and development phase, each lithographic scene was well researched through interviews with the Commanding Officer, Executive Officer and other personnel of the ships. The series included all of the carriers of the U.S. Pacific Fleet (COMNAVAIRPAC) during the 1980s. These carriers were USS Enterprise (CVN-65), USS Coral Sea (CV-43) both homeported at NAS Alameda, USS Constellation (CV-64), USS Kitty Hawk (CV-63), USS Ranger (CV-61), all three homeported at NAS North Island, and USS Midway (CV-41), forward deployed to Yokosuska, Japan. All of these lithographs were produced in limited quantities (production runs were between 2,500-6,000 prints, depending upon the ship’s requirements) and were only available on the ship for which it was designed. A few were sold though his company, but when sailors from the ships requested copies of the prints, they were usually refered to the ship, for the price was much cheaper through the ship’s store. The lithographs being offered for sale on this site are part of the original production runs for these ships. They were discovered upon Mr. Freeman’s death in May of 2002 and are limited in quantity. Currently, there are no plans to provide another production run of these historical documents. Read about the process used to create these remarkable portraits.